I LOVE this picture! I call the big pecan tree at my grandmother’s house the “family tree". It was the center of my universe of bliss as a child, and considering my “family history", it is the most accurate representation of any healthy parts of family and bliss and connection to the good parts of family that were available to me, and that time was when this was the most true. 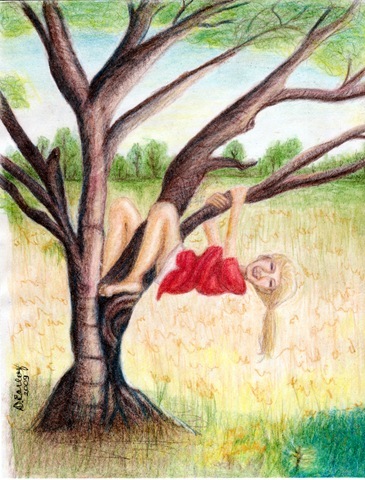 I included photos of that tree in my first 2 journal pages: “Little Girl Bliss” and “Family Tree.” Those of my siblings who were old enough before Grandmother moved away from the house in the country, including myself, all used to LOVE climbing on the pecan tree and playing on and around it. Many many wonderful memories of many kinds in, around, and in the vicinity of that great tree. In this picture, the cornfield is behind me, and I am facing the driveway by the back of the house from this angle. That’s definitely me in the picture, of course. Happy moments! This was done entirely in colored pencils—a first for me. I am trying to learn how to use colored pencils better, as my last piece was the victim of “wax bloom” and by the time I discovered what was the source of the haze, I had added other media that made it impossible for me to correct it. I may go back and do that one over again, at least the background, but I’d have to start from scratch on the background portion and lay over the rest of the image as a transfer. But for now, I am busy constructing all of the images that I want to do for a series of “memories” from around my grandmother’s house and vicinity. This is the second or these drawings that I have done so far. The first is a quick sketch (aka “stage 1”) done in graphite and charcoal and I’ll upload it shortly. I’m still not happy with my media skill with colored pencil coming out of this one, because I am still not getting the depth of color that I want before I have difficulty getting the paper to accept more layers, and I’ve seen colored pencil drawings that did achieve this, so I see potential to improve. Could just be the cheap paper I’m using, or how I am constructing the layers. I’m applying layers with a lighter touch with multiple layers in the buildup, and I’m using a workable fixative between sets of layers to avoid wax bloom and regain tooth, but I still don’t get back consistent tooth after applying the workable fixative as I feel there should be after about the 10th layer and then applying the workable fixative. Maybe I need to apply more layers of the fixative, or be more careful about skin oils or other pollutants that are getting on the paper, or something else? Will continue to work on refining technique with the pencils.